Dreamy Georgian earrings in aqua and pink. Who is in the mood to admire a pair of truly lovely antique Georgian earrings? Hopefully everyone reading this, because that’s what’s about to happen to you. How lovely is this photo? The Georgian earrings look like they’re doing their best “Draw me like one of your French girls” pose for our benefit. I, for one, am quite appreciative. These beauties date to the early 1800’s, around 1830. Like many jewels of the period, these Georgian earrings feature foiled-back gemstones: the back of the sealed 15k gold setting of each stone features a thin layer of foil, thought to catch the light and enhance the piece’s color and beauty. 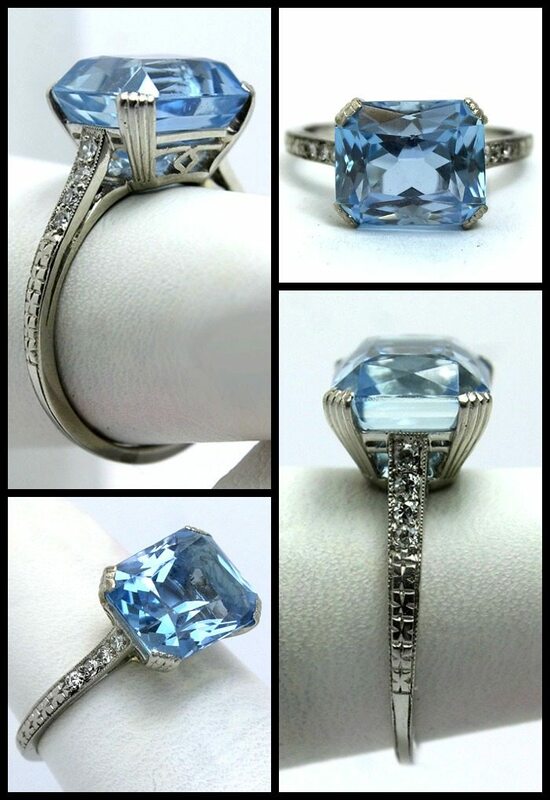 The large, lovely blue stones are aquamarine. The smaller pink stones are slightly harder to identify; the seller describes them as either pink topaz or pink crystal. Either way, they’re incredible. In my opinion, the color combination (well, and quality) is what makes these Georgian earrings so special. Pink + blue + gold is one of my favorites. It was actually the color scheme I used for my wedding. The earwires are not original, but they integrate smoothly into the design and make these pretty pieces of history easily wearable. What do you think, my dears? Will you be dreaming of these Georgian earrings too, or would you prefer something more modern? Or in a different color, perhaps? Tell me your thoughts. These lovely Georgian earrings are currently for sale by Glorious Antique Jewelry (appropriate name) on 1stdibs. All images and info are thanks to Glorious Antique Jewelry and 1stdibs. 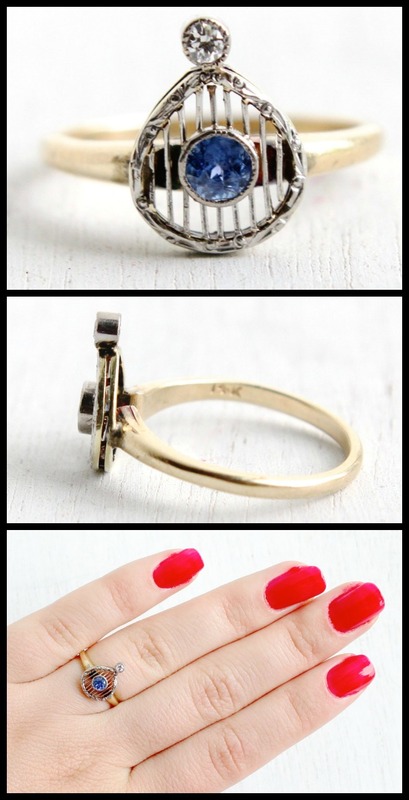 Etsy wishlist: all the antique rings. 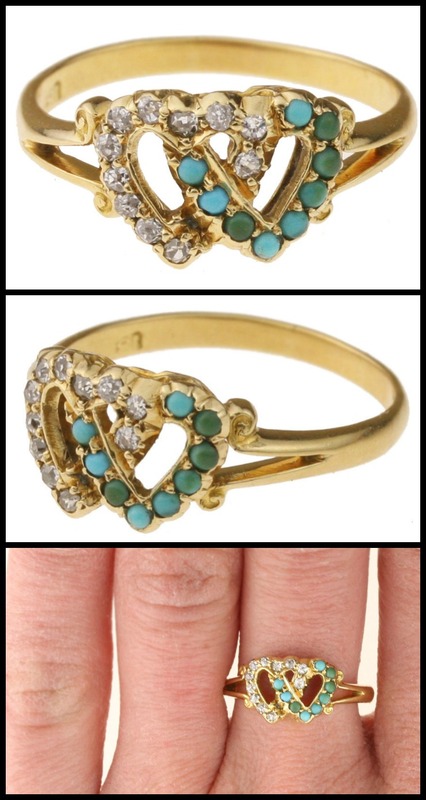 There are so many lovely antique rings I want to buy on Etsy right now that I can’t even handle it. My dears, won’t some of you please give these pretties a home before I buy them myself? Really, the issue is that I’ve discovered some really amazing Etsy stores recently through Instagram, and I should give you store profiles on all of them. It’s possible I’m hoarding knowledge from you, darlings. I’ll try to convince myself to share. 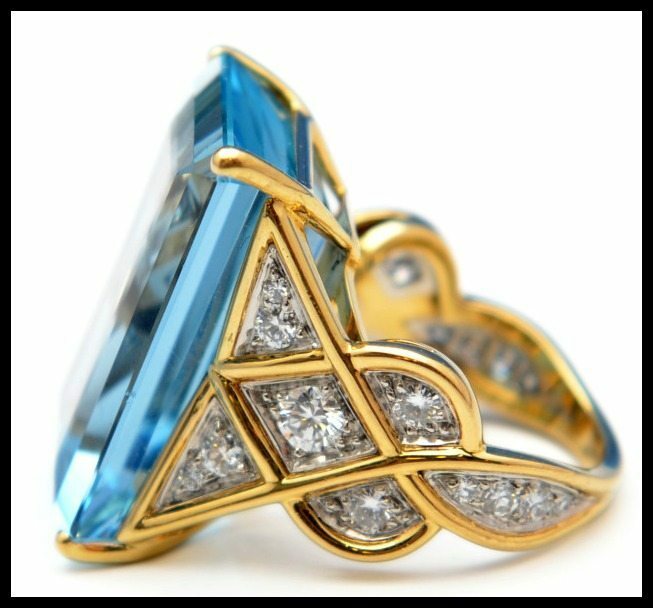 I’ve developed the desire for a twin heart ring. I’m not sure where it came from, but apparently that’s another thing to add to my mental jewelry bucket list. This one is glorious. 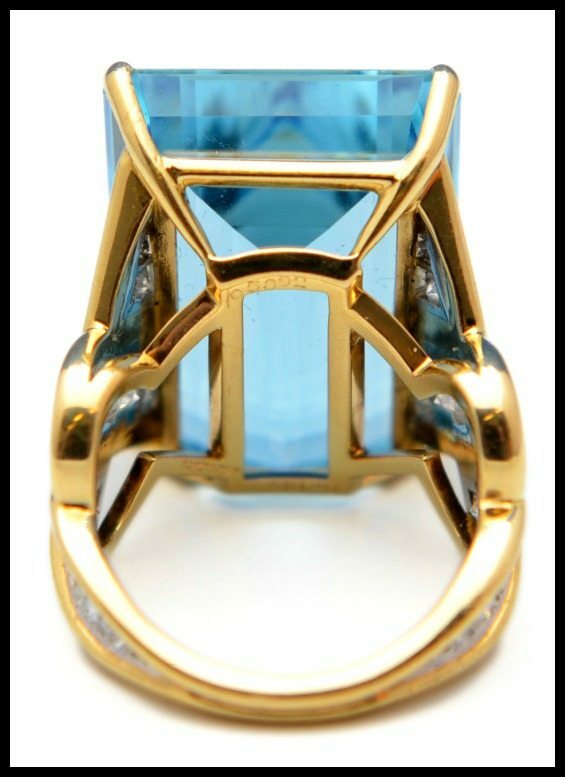 you know how I feel about turquoise and diamonds together. This beauty is an Art Deco era piece by Raymond Yard. It actually poses no danger to my wallet because I could never afford it in a million years. It’s gorgeous, though, isn’t it? It dates to the 1920’s. 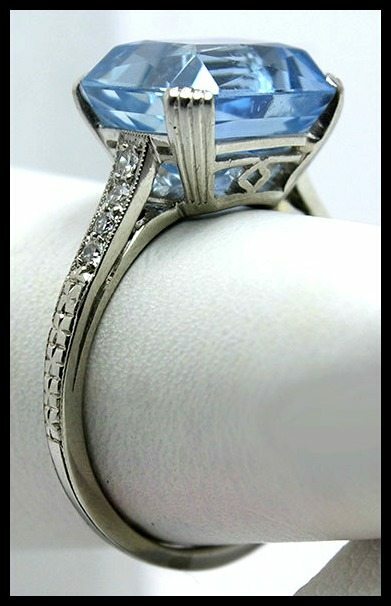 That aquamarine is just under 4 carats, and the side diamonds and engraved platinum are simply divine. 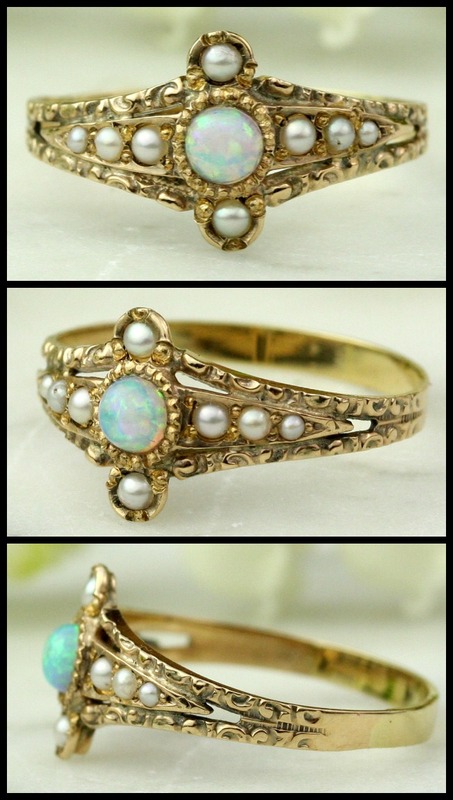 Take a gander at this amazing opal and pearl antique ring. This rose gold beauty is Victorian, with seed pearls and a central opal. The gold work on this one leaves me speechless. 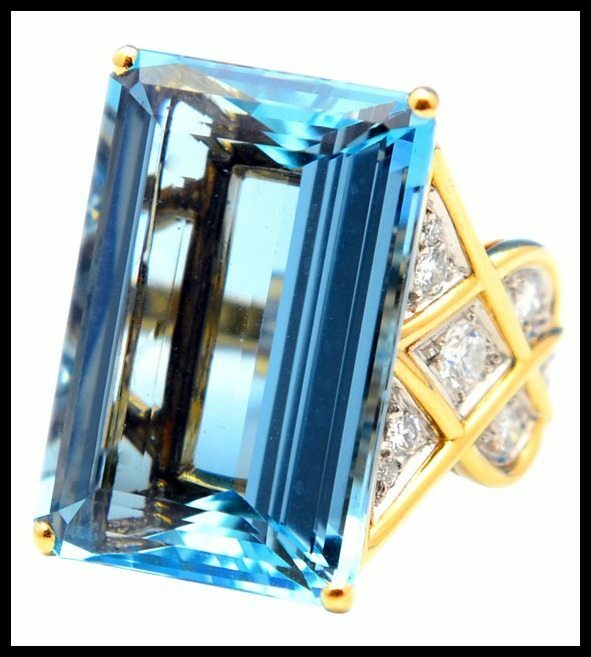 I’ve had a crush on this bizarre Art Nouveau sapphire and diamond ring ever since it appeared on Maejean Vintage’s Instagram a while ago. Look how weird and dainty it is! I just love it. 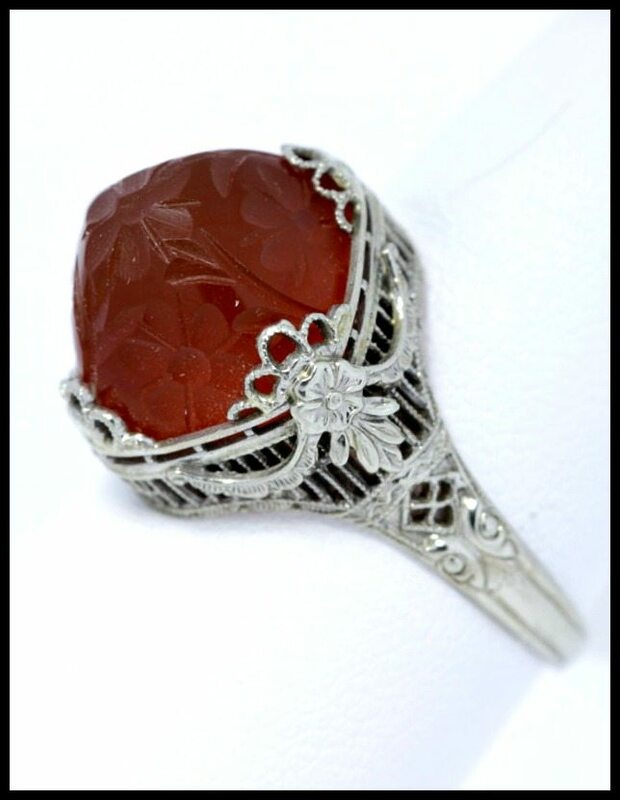 This carved carnelian ring isn’t actually described as antique, but it looks Art Deco to me; certainly Art Deco-inspired, even if it’s not actually an antique ring. Just look at that luscious white gold filigree! and the carved flowers on the carnelian. Exquisite. My desire to own this amethyst and diamond antique ring is really rather severe. I love the shape, the colors, basically everything about it. 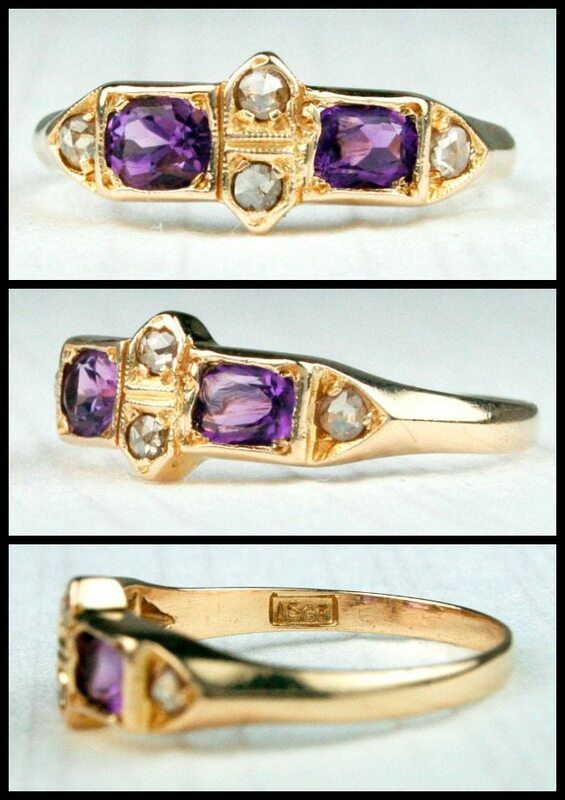 It’s Victorian, with amethysts and rose-cut diamonds set in 15k gold. A real little beauty. All images and info in this post are thanks to the Etsy store that is offering each of these antique rings for sale. Please see the links in each individual description for original source. For my beginner’s guide to buying antique jewelry on Etsy, please click here.